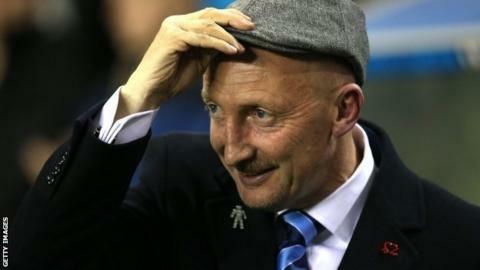 Millwall moved above Barnsley in the Championship table after a battling win away at Wigan. Ipswich loanee Carlos Edwards' deflected effort split the two sides and moved the Lions up to 22nd place. Jack Collison came close to equalising for the Latics late on but his effort went just wide. Millwall have now recorded back-to-back victories while defeat for Wigan is only their second in thirteen league matches. Latics manager Uwe Rosler made eight changes to his starting eleven ahead of the FA Cup semi-final against Arsenal while his counterpart Ian Holloway named an unchanged team on the back of a 2-1 win at Nottingham Forest. The visitors looked much more livelier from the outset and it was no surprise when Edwards carried the ball almost half the length of the pitch and scored with an effort that diverted off Leon Barnett and looped over the head of goalkeeper Scott Carson. Marc-Antoine Fortune and James McArthur replaced Nicky Maynard and Josh McEachran at half time as the Latics tried to force their way back into the game. Fortune headed wide of David Forde's goal while Nick Powell - a second-half substitute - almost scored with his first touch after replacing James McClean. But they knew it wasn't to be their day when Jean Beausejour cleverly found Collison 12 yards out, only for the midfielder's shot to curl inches past the post with the goalkeeper beaten. Milllwall nearly doubled their advantage in the closing stages when Scott Malone's blockbusting drive was parried away by Carson, who then kept out the follow-up from Steve Morison on the goalline. "When you start a game like that it is very difficult to get anything in football. "The second half was OK, and I don't think we could have done any more except score a goal. "We pinned them back, they only had one chance, and we did everything we could to rescue the game. "But we gave the first half away. There were big holes in midfield." "I'm delighted. Whether Wigan had half an eye on the FA Cup semi-final I don't know, but you can't argue with the way we played. "We moved the ball around well in the first half and we scored a great goal. "The second half was different - we were up against it and got a little bit nervous. "But we hung in there and the last two games have given me a little bit of hope and pride for the future." Match ends, Wigan Athletic 0, Millwall 1. Second Half ends, Wigan Athletic 0, Millwall 1. Attempt missed. Marc-Antoine Fortuné (Wigan Athletic) header from the left side of the six yard box is high and wide to the left. Assisted by Shaun Maloney with a cross following a set piece situation. Foul by Scott Malone (Millwall). Attempt saved. Emmerson Boyce (Wigan Athletic) right footed shot from the centre of the box is saved in the centre of the goal. Assisted by Shaun Maloney with a cross. David Forde (Millwall) is shown the yellow card. Corner, Wigan Athletic. Conceded by David Forde. Offside, Wigan Athletic. Emmerson Boyce tries a through ball, but Marc-Antoine Fortuné is caught offside. Corner, Wigan Athletic. Conceded by Alan Dunne. Attempt blocked. Martyn Woolford (Millwall) left footed shot from the centre of the box is blocked. Assisted by Lee Martin. Marc-Antoine Fortuné (Wigan Athletic) wins a free kick on the right wing. Attempt saved. Steve Morison (Millwall) right footed shot from the left side of the six yard box is saved in the centre of the goal. Attempt saved. Scott Malone (Millwall) left footed shot from outside the box is saved in the centre of the goal. Foul by James McArthur (Wigan Athletic). Corner, Millwall. Conceded by Jack Collison. Attempt missed. Jack Collison (Wigan Athletic) right footed shot from the centre of the box is close, but misses to the right. Assisted by Jean Beausejour. Substitution, Millwall. Steve Morison replaces Stefan Maierhofer. Substitution, Millwall. Shaun Williams replaces Edward Upson. Attempt missed. Nick Powell (Wigan Athletic) right footed shot from the right side of the box is too high. Assisted by Shaun Maloney. Attempt blocked. Nick Powell (Wigan Athletic) right footed shot from the centre of the box is blocked. Assisted by Shaun Maloney with a cross. Corner, Wigan Athletic. Conceded by Mark Beevers. Attempt blocked. Nick Powell (Wigan Athletic) right footed shot from the centre of the box is blocked. Substitution, Wigan Athletic. Nick Powell replaces James McClean. Attempt missed. Shaun Maloney (Wigan Athletic) right footed shot from outside the box is high and wide to the right. Assisted by Jean Beausejour.